This refrigerator dill pickles recipe with stop you from ever buying pickles again. I have done pickled green beans and pickled carrots on Snack Girl but never cucumbers. What was I waiting for? I have no idea. Maybe I thought cucumbers were too obvious. Fresh pickles are so wonderful to put on sandwiches, burgers, in salads, on your toast – whatever! They are easy to make, especially if you have a food processor on hand with a mandolin slicer. I can see you laughing! 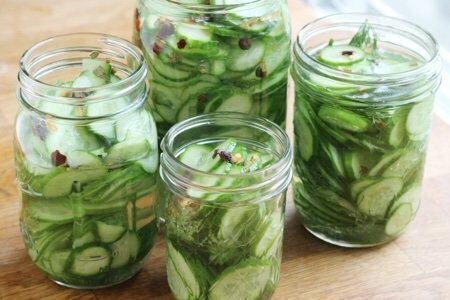 I sliced 2 pounds of small cucumbers in about 1 minute, tossed them into jars with dills, made a quick pickling juice and was DONE in no time flat. Then, they lasted in my refrigerator for about 2 hours after they were finished because every one in my family loves pickles (except the dog). I used pickling spice because I had some hanging out in my spice drawer. You can use whatever you want to flavor dill pickles – red pepper flakes, cardamom pods, peppercorns, garlic, or nothing! This makes it more fun to make pickles when you can customize them. The below recipe has ½ the salt than the original recipe that I started with because I found it too salty – maybe YOU will find my recipe too salty. These are refrigerator pickles because you are not going to do the final step of canning them so that they can be put on the pantry shelf. You have to heat the jars and seal them. I don’t want to can these pickles because the process cooks the cucumbers a bit and makes them mushy. This way, the cucumber is raw and it is crunchier (which I like). The downside is that they will go bad after about a week versus the canned version which will survive Armageddon. 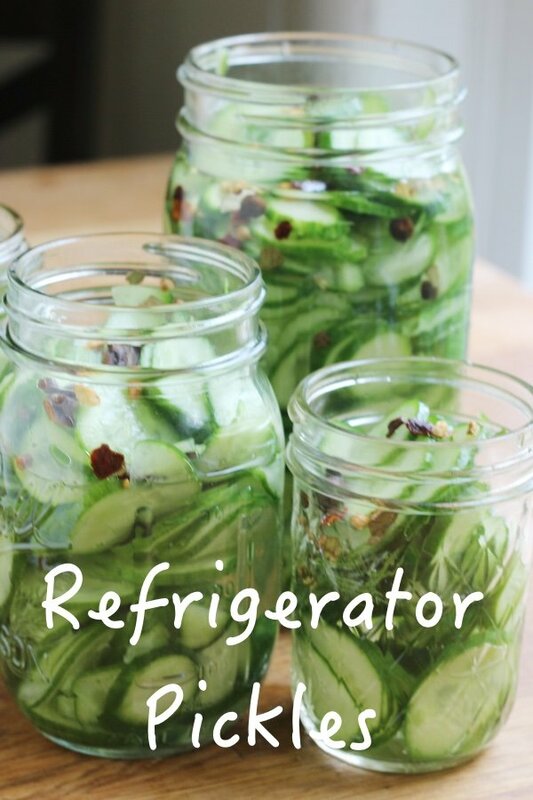 Have you made refrigerator pickles? How do you season them? Slice cucumbers on the mandolin of a food processor. Mix water, vinegar, sugar, salt, and pickling spice (if using) in a medium saucepan and heat until salt and sugar dissolves. 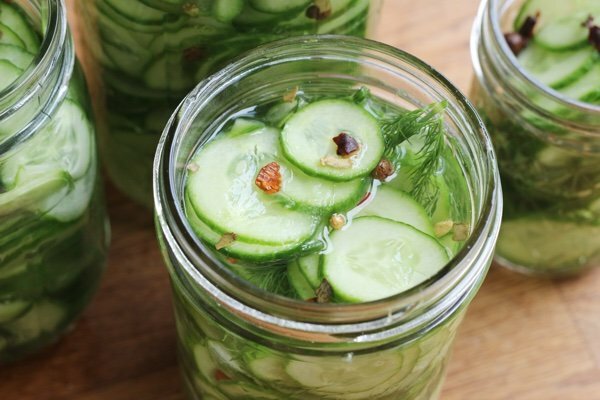 Pack a couple of dill sprigs in mason jars along with cucumber slices. Pour in pickling solution to cover and place in refrigerator. These are ready to eat in 2 hours but can be store and eaten for a week. I love dill pickles! Do I have to slice them? Can I use the full pickling cucumbers (baby cucumbers I guess). Thanks! We ‘refrigerator pickle’ our garden cucumber pickles all during August using almost an identical recipe except it has no expiration date! In fact, we don’t eat them until 2 weeks have passed, preferably 1 month. They are delightfully crunchy and right now we’re on the last quart from last August. 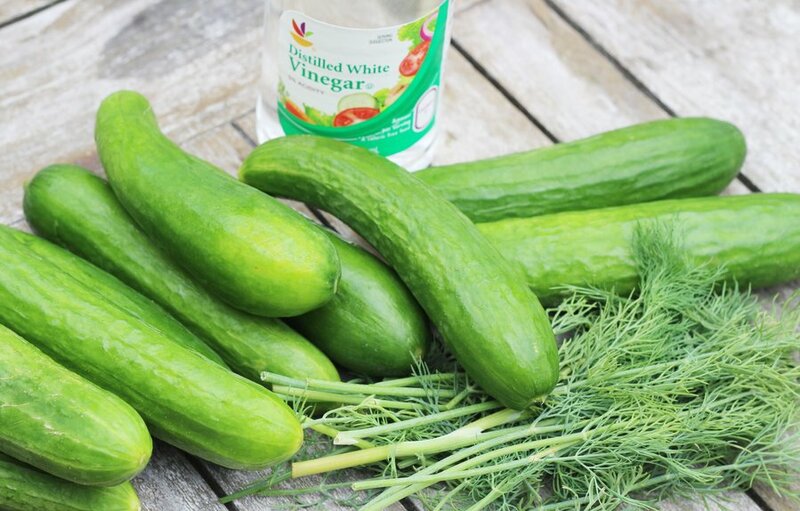 My major difference: Per quart of ‘whole’ cukes, 1-1/4 c. vinegar, 1-1/4 c. water, 1 Tb. + 1 tsp. kosher salt, boiled a full 5 mins. =brine. Spices are personal preference, we use 2 halved garlic cloves, 1 lrg dill head [or tsp. dry dill seed], some with red pepper flakes or pinch of sugar. We start with sterilized jars from the dishwasher, making sure brine covers tightly packed cukes, and leaving 1/4’’ head space. We can do 1-4 qts in under an hour total. The pickles continue to improve over the months of storage. I’ve stored them for 12 months and they just increase in flavor. I think perhaps, they stay crunchy because they’re whole. The only drawback is my top fridge shelf is dedicated to pickles for a long time. But, everyone loves a gift of pickles! If you want to make Japanese pickles, here is how. Slice, salt and press slices of cucumber. I use a Japanese pickle press. Layer the slices in the press salting each layer before adding the next. Screw down the press and leave for about 30 to 40 minutes. Pour off the excess water and rinse the veggies in fresh water. Bottle in salt and vinegar and your favorite spices. I don't use any spices just a little salt and vinegar in water. Refrigerate. Pickles come out crispy and delicious and make a great snack or serve them along side your Japanese foods like steamed rice, tempura, teriyaki, sushi, sashimi, or yakisoba. My husband makes them from already made pickle juice (leftover juice). I love the recipe from Sara Moulton's website & program. Homemade is always better than store front and so much cheaper. Yah, Snack Girl!!!!!! 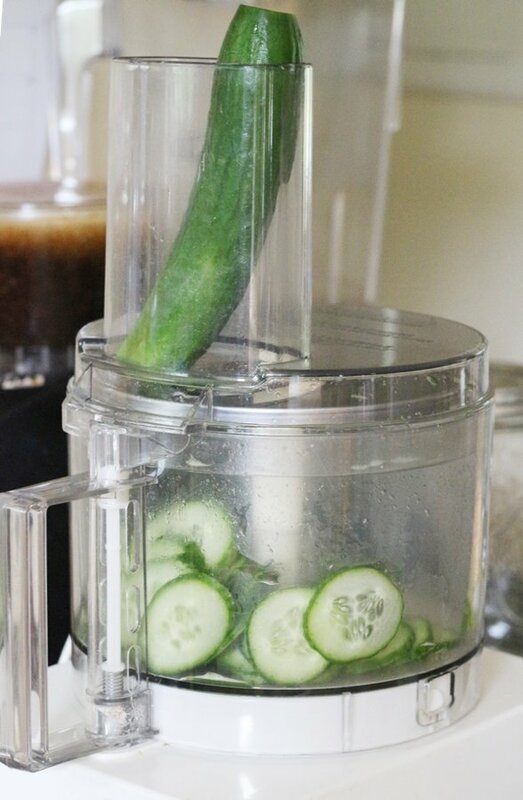 I never thought to use the food processor like that to get thin chips for making bread and butter pickles! How genius! I really want to try this the next time I pickle my own pickles. Thanks so much for sharing your recipe! I'll report back once i've made it, hopefully it turns out as good as yours!